Welcome to the Our Daily Bread Designs September Release Blog Hop! If you arrived here from Lorelie's Blog, you are in the right place, if not, you might want to start at the ODBD Blog, and hop from there. There will be FIVE $15 ODBD Gift Certificates given away as prizes this month - for full details click here. The Hop will run 8am EDT Sept. 1st til 8pm EDT Sept. 2nd. I used The Good Seed, Seed Packet and Seeds stamp sets all from the September Release along with the beautiful Dahlia and Sweet William Small Flowers. Both projects use the Garden Can/Seed Packet Template, the larger one is cut to size from Grey card stock using the eCraft. The smaller one I resized and cut from a piece of Ten Second Studios Metal, I resized it so I could emboss the watering can, and add a small bouquet of flowers, that I created with the Sweet William stamps. 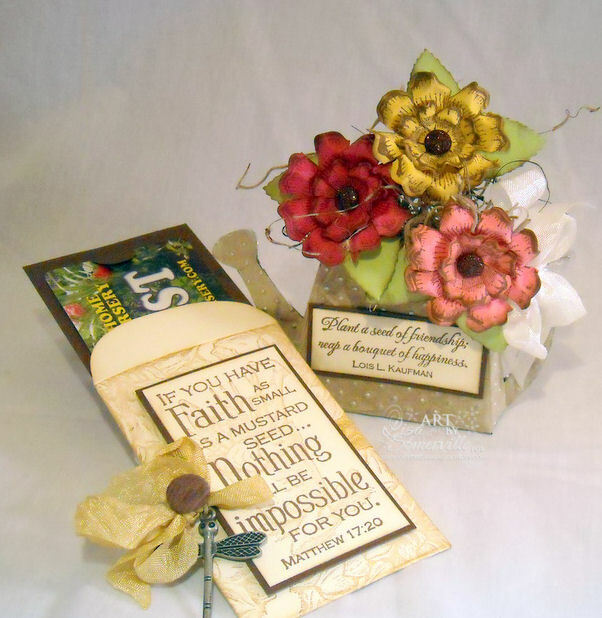 I thought the seed packet kept at it's original size made a wonderful Gift Card Holder. To decorate the seed packet, I stamped the Dahlia in Caramel, then stamped the verse from the Seed Packet on in Coffee on a Vanilla panel, and over stamped the pot in Caramel, layering on a Chocolate panel, then to the seed packet. For the larger watering can, I stamped the Dahlia image in Malted Milk Paint, heat set and added the flowers in Grey. Embellishing the can with some Seam Binding and a Vintage Button. The Seed Packet inside the can was enlarged using SCAL3 so fit the ODBD Seed Packet image. The image is stamped in Grey on Vanilla then colored with Markers. The pot image is from The Good Seed, and stamped in Black Archival on Watercolor paper, coloring using the Marker Watercoloring and Out of the Box Techniques. I hope you enjoyed my projects, as much as I enjoyed creating them! Your next stop on the hop is Gemiel's Blog. Remember, to be entered into the drawing you need to leave comments on each designers blog, then return to the ODBD Blog and leave a comment, letting them know you completed the hop and noting any blogs you were unable to comment on. PS - Thanks to eveyone for your kind words on my Funky Sneakers! The winner of the free template is Shawn from Classic Creations by Shawn, please email me to claim your prize! Beautiful, beautiful projects! Wonderfully done! Your project immediately brought a smile...so clever and beautiful. Thanks for sharing your creativity! What a fun and beautiful project Lisa!! Great use of all those stamps! The flower bouquet is my fave. Lisa!! What a fab project!!! and I love how you incorporated Dahlia/Sweet William into it. Clever you! What stunning little projects you created Lisa. Lisa this is such a great project! I love each element and how you made the dp yourself with the dahlia! Fun project! Thanks for joining us this month on the hop! wonderful Lisa - love them all! This is just beautiful! What a great gift set! This is just stunning. Love looking at all the perfect details on each piece. Wow! Love that watering can full of flowers. Now I know what I am getting for my birthday. LOL! Wow, Lisa, these are gorgeous! That watering can is amazing and the flowers are fab. My, my. This is terrific. I love the small watering can and flowers. Gonna go try my hand at that one right now. Oh my goodness, Lisa! These projects are just so amazing! Love the watering can!! Hugs! Such a cute idea the paper design. Love love it! Great job. Love the water can. Beautiful job! Such lovely projects, Lisa! Love them all! Lisa this is one gorgeous ensemble!!! Your seed packet is perfect!!! And MBL is gonna LOVE that dragonfly! What fun you must have had making all these lovely items....such creativity. Love the watering can and the seed packet gift card is adorable. Using the Sweet Williams with that sentiment is fabulous. 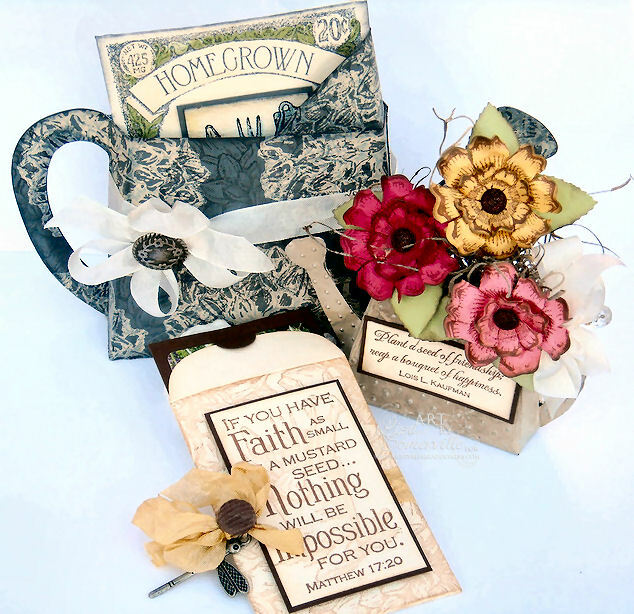 The watering can is gorgeous and what a great idea, using the seed packet for a gift card holder! BEAUTIFUL, as always. Fabulous job with the entire set! I love the watering can to hold your seed packet. What a sweet project! Wow, I must say, your cre8tivity amazes me everyday! Luv the projects, the watering cans are fab! both large and the smaller metal one! Very clever and very beautiful! Love all of the details and all of the elements. . .and those gorgeous Sweet Williams from a couple of months back! The blue watering can is just beautiful! Blessings! I hope who ever receives it appreciates the fab work that went into it. Absolutely wonderful ideas...and beautifully done. your creations are so magnificent! awesome, what you show us here! GREAT job and soooo inspiring! I really like your watering can and flowers. How pretty! Great set, I love the flower box! What a neat gift. Good job. Oh my goodness - LOVE your projects, they took my breath away!!!! What a fun & beautiful project. Love the tea cup. Thlflowers are great too. Your presentation is lovely. Love your flowers. Wow - you outdid yourself on this one! It is obvious that you have put a great deal of time,thought and effort into this beautiful project. Thanks for sharing your talents with us. Oh I can't wait to see this stamp set.... You did a beautiful job!!! Great projects. Thanks for sharing. What a gorgeous set!!! love that watering can!! these are so pretty, what a great little gift for someone. Love loved them. Makes me want to go and make some to give out for Christmas gifts. Where did you get all this talent! Your projects brought out the best in this theme and these stamps. Good job! Very creative. Nice gifting idea. Your projects really make great use of the new stamps. Thanks for sharing. Beautiful projects; love the colors. Thanks for sharing. Great project, love the stamps. Such an AMAZING amount of work put into this LOVELY ensemble! Absolutely beautiful in every way! Lisa, what a wonderful project. I love it. So creative and beautiful. Oh my how inspiring all these wonderful things are. I just love the boughet, and the gift card holder is beautiful. Well I do love it all! Your projects are fabulous!!!! So creative!! What a wonderfully creative project! Love the flowers & GC holder. Lovely card! Those colors are greast! WOW! WOW! WOW! WOW! WOW! I love all of this from the watering can to that stunning die cut flower arrangement! Awesome project, Lisa! i love the flowers on your first card and the watering can is super. so clever. you do great work. Great! Great! This is a wow punch. Love your useof colors and the details are just wonderful. What a way to show your creativity! Your project is great in every detail! What a blessing for us to have such a talented design team to showcase these terrific new ODBD sets! Thank you. Que bello todo, me encanta. Beautiful, Lisa! Love your "seed" collection. Very creative! Love all of this collection, especially the watering can. Great work. The watering can is so cleaver. Cute projects. I too like the watering can. 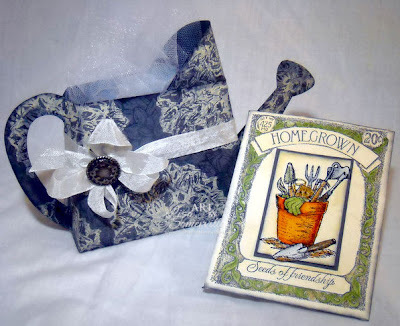 Very pretty projects, love how you used the garden can and seed packet. Really like your projects, especially the watering can. Thank you for sharing. Amazing projects - so pretty! Very Awesome and Amazing project. So Gorgeas. Pretty color combinetien That watering can is so cute. Love the Bahila and sweet Williams flower. I love the watering can! It is such a beautiful project, thank you for sharing it. Simply adorable, Lisa! Just LOVE the watering can. Have a great weekend! Your projects are all so pretty! I love the little watering can and the pretty seed packets. Those flowers are amazing! What a great project - a very creative way do display the stamp set. This is so pretty! Love the colors, and I ordered this set yesterday! What a creative card. It is beautiful. What a cute ensemble Lisa!! That will make such a great gift! Very pretty. I love the pocket idea. So many possibilities. Beautiful! I think it might just be my favourite so far. Love the flowers and the way you used the products. Very nice project, thanks for sharing. wow, i love this whole project - especially how you've done the watering cans. wonderful! These projects are beautiful! Great ideas. Love them. So beautiful, Lis! Love th eoone with the colorful pot!